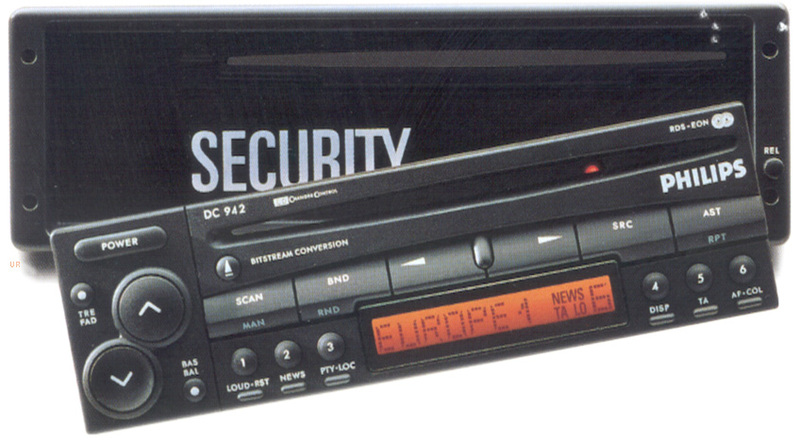 The Philips DC942 brings quality longwave, AM, FM and shortwave reception to your car. Shortwave reception includes only the 49 meter band (5950 to 6200 kHz). Long wave coverage is 144-288 kHz. The 4x30 watt RMS amplifier offers superb sound. A CD deck is built-in. There is an electronic fader, stereo balance and separate bass/treble controls. A total of 36 memories are available (6 FM 1, 6 FM2, 6 FM3, 6 MW1, 6 MW 2, 6 LW and 6 SW). Other features include: 4 channel line-out, auto-store, removable head, telephone mute, warning LED, manual and automatic frequency search, adjustable LCD view angle, switchable green/orange illumination, clock and RDS where available.